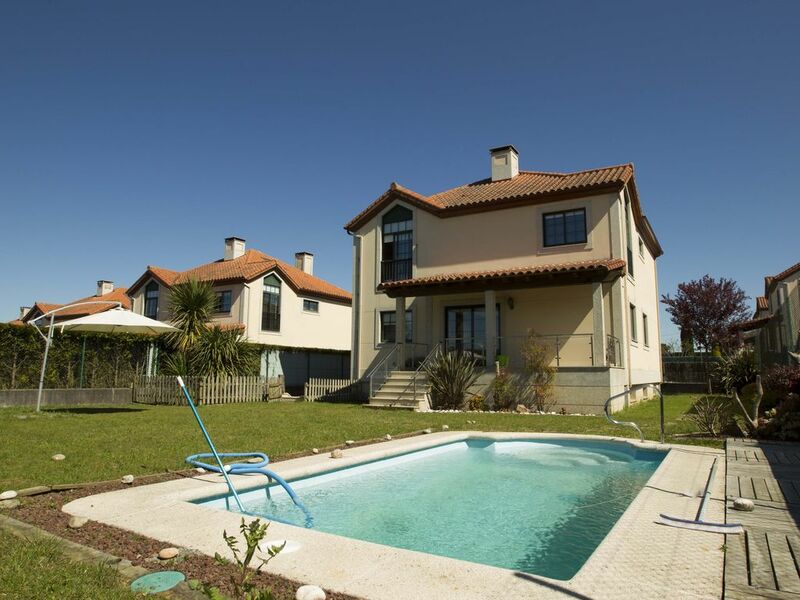 300 m2 detached house with a porch, fully furnished, the plot is 600 m2 with a garden and pool area. The basement with direct light, has, rustic living room, cellar, bathroom and laundry. The ground floor has a kitchen, living room with fireplace, a bedroom and a bathroom. The first floor has 4 bedrooms and two bathrooms. All rooms have fitted wardrobes, there is also heating installation throughout the house. This house was spacious and clean, and a great place to stay with our family and friends. For young children there were stair gates provided. There was ample parking space in front of the house. The children and us very much enjoyed using the garden and pool. We could keep an eye on the children easily from the veranda. We visited some of the numerous, and uncrowded local beaches that are within easy driving distance. Antonio was very helpful with recommendations regarding the local area. Easy to find, well kept and exceptionally clean property. Hoping to stay again next year. Casa grande ,cómoda y decorada con gusto. Cocina muy bien equipada sólo faltaba una cafetera italiana( de las de siempre), se la pedidos a Antonio i enseguida nos la consiguió. Casa perfecta para 9 o 10 personas. Muchas gracias por tu comentario Juana Maria. Ha sido un placer teneros de huéspedes. Me gustaría tenerte como huésped de nuevo el próximo año. Hemos disfrutado mucho en la casa, que es muy amplia y estuvimos 10 personas muy cómodamente. Está perfectamente equipada, es muy agradable y tranquila. El dueño muy atento. Totalmente recomendable. Estuvimos en el chalet, desde el 16 de agosto hasta el 3 de septiembre, mi esposa y yo, con mi hija, mi yerno y mi nieto de 5 años. Antonio Barros, su propietario, nos atendió siempre con extrema amabilidad y eficacia. Así, cuando, al entrar, le solicitamos una mejor limpieza del chalet, nos proporcionó una persona con prontitud. Igualmente, tuvo el detalle de no cobrar los días adicionales de septiembre. Para cuatro adultos y un niño, nos sobró espacio. La piscina está muy bien atendida, lo mismo que el jardín. Las camas de matrimonio, de 1,35 m., las encontramos pequeñas y los colchones mejorables. La cocina está bien equipada y el salón comedor es amplio. La ubicación es muy buena pues está cerca la autopista que te lleva a Coruña en unos 12 minutos y Sada se encuentra a solo 4 kilómetros, localidad donde se encuentran varias cadenas de supermercados. En resumen, la casa nos resultó cómoda y nuestra estancia agradable. Muchas gracias por tus comentarios, pero tienes un error en la fecha de llegada, porque fue el 16 de Julio y no de Agosto. Chalet located in the best residential area of ​​the Ria de Betanzos SADA 6 km and 4 km from Betanzos. Gandarío has beaches and Pedrido 3 km, the Sada 6 km, the de Miño 7 km and 12 km of Perbes. Betanzos is a beautiful village bordered by the river Mandeo, 13. 000 inhabitants which originated in the 13th century. It was one of the seven provincial capitals of the Kingdom of Galicia. The old town is declared a historic-artistic and has three Gothic churches that give it character. The churches of Santiago, Santa Maria do Azogue and San Francisco. In the latter are the most charismatic medieval tombs like that of Perez de Andrade, supported by two animals, symbol of his lineage, boar and bear. Park also has a Pasatiempo, magical place to visit with children. It has multiple restaurants and bars where you can delight among others the famous tortilla de Betanzos. SADA is a fishing village with more than 15 000 inhabitants which substantially increases its population in summer and whose main activities are fishing and tourism. It has a magnificent marina and an unquestionable scenic beauty. We can go in around the Pazo de Meiras, summer residence of Franco, Carlos Maside Museum, the ceramics factory O Castro and Sargadelos. We can also see the listed building La Terraza modernist style. Sada is gastronomy, sea, sport, beach, sun, nature, fun, relaxation. Bergondo can visit the Benedictine Monastery of San Salvador de Bergondo, twelfth-century Romanesque preserved in good condition. A must is also the Natural Park Fragas do Eume, with 9 000 hectares of Atlantic forest of shore. One of the best preserved in Europe. Inside the park is the Monastery of Caaveiro tenth century from which we can see the spectacular Park.